The "Woodstock of the nerds" was quickly renamed the "Woodstock of Physics"
Two decades ago, a raucous circus of scientists descended on a hotel in New York to kick off an event that would become known as the "Woodstock of Physics". It catapulted a select band of scientists into a world of celebrity never seen before or since; and like its rock concert counterpart, the academic happening held the promise of changing the world. The previous year, two of my IBM colleagues, Georg Bednorz and Alex Mueller, discovered a material which exhibited perfect conductivity at relatively warm temperatures. Although known about since 1911, superconductivity had only ever been shown to work at temperatures close to absolute zero (0 Kelvin, -273C), the theoretical state of zero heat energy. Raising the temperature of the effect, it was thought, would open up a world of wondrous applications, such as near-supersonic surface transportation, super-fast supercomputers, ultra-efficient electricity transmission and even exotic Star Wars weaponry. The American Physical Society (APS) meeting of 1987 would see rose-tinted optimism about these developments replaced by a feeling that we were the generation that would make it happen. 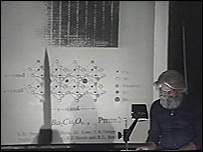 Although Bednorz and Mueller's discovery of a new family of ceramic superconductors, known as the copper oxide perovskites, had been made in 1986, it had been largely overlooked. But when further experiments by Paul Chu and his team at the universities of Houston and Alabama demonstrated superconductivity at 93K (-170C), ripples spread throughout the physics community. When I arrived with Alex Mueller the doors had already opened and pandemonium reigned inside. Their demonstration, 51 degrees higher than Bednorz and Mueller's, broke through a critical barrier on the path to usable high temperature superconductors (HTSC) - namely, the temperature of liquid nitrogen. This fluid is a major industrial commodity, easy to handle, plentiful, non-polluting, and - importantly - cheap. Achieving superconductivity above liquid nitrogen temperatures was the holy grail of the field, and Paul Chu showed it could be grasped. Ever since rumours of a higher-than-liquid-nitrogen superconductor began to circulate, the intrigue and secrecy within the scientific community had rivalled that surrounding the double helix discovery three decades earlier. Researchers from around the world started trying to reproduce the results and work out the exact composition of Chu's material. You'll find only one "official" abstract on HTSC in the programme of the 1987 APS General Meeting. But the flurry of research and the number of new results convinced the normally staid and conservative APS bureaucracy to allow the convening of a special session granting all who applied five minutes to deliver their most recent results. The hall that had been assigned held maybe 1,000 people, but when I arrived with Alex Mueller the doors had already opened and pandemonium reigned inside. There were perhaps 1,800 in the lecture hall and up to 2,000 outside, including some 50 journalists. New York City fire marshals had been called in to clear the aisles. Had I not tipped off the organisers to reserve spaces for the 51 speakers, Alex and I would have been locked out. In the end, the hotel had to arrange for TV monitors to be stationed throughout public areas of the hotel for those unable to get in. What followed was a mammoth romp through the world of superconductivity, headlined by star attractions Alex Mueller and Paul Chu. Results were presented, challenged, questioned and occasionally hotly disputed. At times the talk was deeply theoretical, but at others people speculated on the applications that could be just around the corner. And the showmanship continued well into the night, eventually fizzling out around 3am when even the faithful began to tire. All those who were there knew they were witnessing the advent of a new and exciting rebirth of superconductivity, which had lain moribund and under-funded for the better part of a decade. The flood gates of research money were about to be opened, and everybody wanted their share. 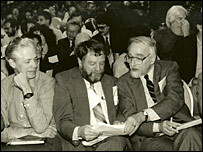 At the same time we physicists had become the toast of the Big Apple. Bouncers at the trendiest discos in Manhattan led us to the head of the waiting lines. All you needed was your meeting registration badge and you were in. 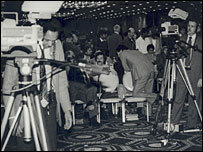 Countless interviews took place, with one reporter characterising the celebration as "the Woodstock of the nerds", a description quickly re-termed, "the Woodstock of Physics". A heady experience it was. And the euphoria persisted for many months. Scientific journals were flooded with manuscripts swamping the efforts of editors and reviewers to keep up. Ronald Reagan even took time out to address us at the White House, and gave a surprisingly astute summary of superconductivity and its possible commercial implications. As it turned out, he had been briefed by Edward Teller only 30 minutes before, and, of course, he was a professional actor. Congress subsequently stumped up for what grew to be a $40m annual programme to develop power applications based on the Bednorz-Mueller and Chu discoveries, a programme which continues to this day. 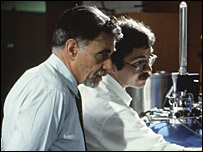 In February 1988, my group found a copper oxide variant that lost its resistance at 125K (-148C), and in 1993 that record gave way to a slightly different compound created by a Russian-Swiss collaboration which worked at 134K (-139C). Twenty years after Woodstock, that's where the record still stands. The two intervening decades have witnessed a remarkable and steady stream of advances in the science and application of high temperature superconductors. Hundreds of millions of dollars have been poured into trying to understand, examine and exploit the promise of Woodstock. In the United States alone, four companies have been created to develop and commercialise HTSC wires and tapes for electric power and mobile phone applications. The US Department of Energy has underwritten more than a dozen demonstration projects using superconducting magnets, cables and wires, all directed towards more efficient and compact generation and use of electricity. Equivalent endeavours, albeit smaller in scale, have been and are underway in Japan, Europe, China and South Korea. But we have still not delivered the vision put forward in that hotel room 20 years ago. There are still hurdles to be overcome, including understanding the mechanism of high temperature superconductivity in Bednorz and Mueller's ceramics, which despite years of experiment still eludes us. This year, veterans of Woodstock, now grey in hair and long in tooth, will convene once more. I expect it to hold no surprises, but it will serve as an occasion to lift a pint and say "we were there". Paul Grant is visiting scholar in applied physics at Stanford University and IBM Research staff member emeritus.